SpaceX's unmanned Dragon capsule attached to the International Space Station during a robotic cargo mission to the orbiting outpost. 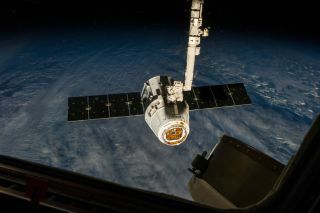 The private spaceflight company SpaceX is planning to launch their fourth official unmanned resupply mission to the International Space Station this week. SpaceX's robotic Dragon capsule is now expected to launch atop the company's Falcon 9 rocket to the orbiting outpost on Saturday (Sept. 20). Dragon was initially expected to launch on Friday (Sept. 19), however, rocket preparations delayed the launch by one day, according to NASA officials. The launch is now scheduled for Saturday at 1:15 a.m. EDT (0515 Sept. 21 GMT) from Cape Canaveral Air Force Station in Florida. If the rocket launch is postponed, mission controllers have the option to try again the next day at 1:53 a.m. EDT (0553 Sept. 22 GMT), NASA officials said.